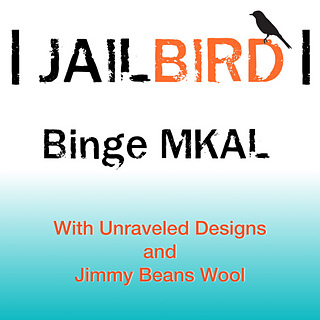 Welcome to the second annual binge mystery knit-a-long inspired by the Netflix series, Orange is the New Black! I am super excited to see where this season goes, and I hope you enjoy this quick project to binge-knit while you binge-watch! Head over to the JBW group and join in on threads for support, questions and just general chat! 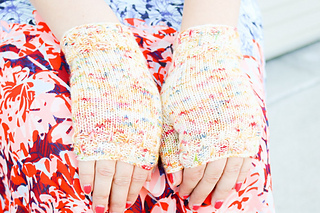 This year, the pattern is a pair of fingerless mitts, in the lovely rainbow, speckle dyed color called Melting Pot. It is dyed by Lorna’s Laces, and was inspired by the blend of different people found in Litchfield Penitentiary. 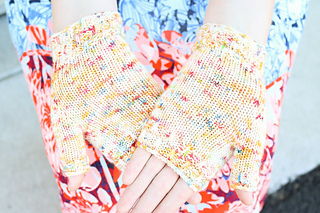 You can choose to knit the mitts with either a short (1 skein) or long (2 skein) cuff. It will stretch to fit a wrist circumference of 5 -7 inches. The gauge given here is in blocked stockinette stitch, however, if you would rather just start knitting and then see if your gauge is correct, I will also include the unblocked pattern gauge in the first clue! The pattern will be released over the course of 3 days, and each clue will be delivered to both your Ravelry library and your email inbox. 200 (400) yards of sport weight yarn, to make a pair of short cuff (long cuff) fingerless mitts. 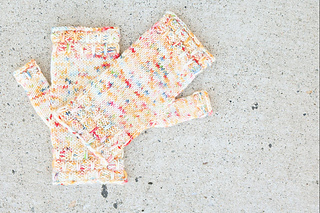 Shown in: Lorna’s Laces Shepherd Sport - Melting Pot. 28 stitches and 36 rows = 4 inches in stockinette stitch, after blocking.